All articles, commentary, etc. that does not fit under Best Practices, Press Releases, Testimonials, or Documentation goes here. Dallas, TX – This week, sales and marketing solutions provider Lead Liaison announces an integration with third-party live chat software, JivoChat. The integration is said to help businesses build a more comprehensive digital DNA of prospective customers, leading to more prosperous engagements. JivoChat’s solution enables businesses to engage visitors in real-time using embedded chat widgets. “Our goal is to streamline customer communication and assist companies in further strengthening their relationships with prospective customers,” says Pavel Sikachev, US Country Manager at JivoChat. Lead Liaison’s integration with JivoChat enriches anonymous Prospect Profiles with key information from chat interactions. Initially, all visitors to a company’s website are anonymous. Preliminary tracking can only provide company, location, and website activity like page visits, for example. With Lead Liaison’s JivoChat integration, visitors are converted from anonymous to known Prospects. When a chat begins, the chat system collects contact information such as name, email, and more. The contact information is added to the anonymous record to identify the individual. In addition to enriching the Prospect record, Lead Liaison logs chat activity, such as when the chat begins and ends, along with the chat content. When a chat occurs Prospects are automatically scored, as well. Lead Liaison also offers integration with other 3rd party chat systems, such as Drift, Intercom, Olark, LivePerson, LiveChat, and more. Lead Liaison provides cloud-based sales and marketing automation solutions that help businesses accelerate revenue by attracting, converting, closing and retaining more prospects. Filling a void in the small pool of automation providers that focus on marketing-centric functionality, Lead Liaison gives equal focus to sales providing sophisticated visitor tracking and sales automation to boost sales effectiveness. Additionally, Lead Liaison is the global leader in event lead management, enabling companies to capture and manage leads from trade shows and events. Lead Liaison blends ease-of-use, a flexible architecture, deep external integration, marketing across social, web, mobile, email and offline channels and powerful functionality into a single platform, called Revenue Generation Software®. Lead Liaison is headquartered in Dallas, Texas. For more information, visit http://www.leadliaison.com or call 1-800-89-LEADS (895-3237). To access our Press Kit, visit www.leadliaison.com/press-kit. The ecommerce industry has been continuously growing with a rapid speed over the past few years. The trend towards ecommerce is showing no signs of slowing down. In fact, shopping has become one of the most popular activities over the internet. More than 1.66 trillion customers are buying goods and services online. As per prediction completed by Statista, global retail ecommerce revenue will amount to $4.88 trillion by 2021. While the numbers make online business owners happy, this is still a competitive industry. In order to stay ahead of the competition, companies need to offer exceptional customer service to their customers. Customer service is key to ecommerce growth. Companies need to have the right tools in place in order to deliver the best customer experience. One of these customer support tools is live chat. As per research report of an Aberdeen group, live chat is the most preferred method of communication for online shoppers compared to other communication channels. A study by the AMA states that customers are more likely to make a purchase from a website offering live chat service compared to those who don’t. What is E-Commerce Live Chat? Live chat is a communication platform that facilitates you to give support to the customers’ queries or to assist visitors to your website in real-time. With the help of live chat software, customers’ queries are solved within a few minutes. This blog post will examine the top reasons why live chat is a must tool for your ecommerce business and how it converts visitors to customers and boosts conversion rate and sales. In this digital era, speed is king. Customers are looking for quick and helpful responses. They do not like to be put on hold or wait too long to get a solution to their queries. With every late reply, you are creating a chance to lose a lead. Live chat is the best option to have real-time conversations with your customers, reducing response time and boosting conversion rates. An agent can proactively start the communication with the visitors and can suggest to them products based on their purchasing behavior. Most of the companies are implementing live chat software on their website do so in order to give quick, convenient support to the customers and to improve customer service and response times. According to Econsultancy, more than 70% of customers were satisfied with their live chat experience compared to all other channels including phone or email. 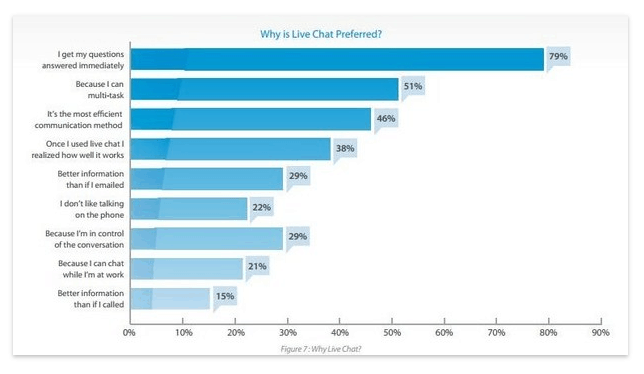 This data proves that live chat is the best tool to boost conversion rate and sales. With the help of live chat, your customer service representatives will be able to handle multiple customers and can instantly respond to customers. If the customer’s concerns are solved quickly, this will leave a good impression leading to a more sustainable relationship and an improvement in retention rates. Businesses are always looking for a cost-effective customer service solution. Studies show that live chat is the best and most low-cost communication channel. More and more companies are switching to live chat from phone or email support as they are too costly to maintain and setup. Implementing a live chat feature on your website will generate more revenue compared to revenue generated by emails or phones. Cost per interaction – It considerably decreases the cost of recruiting more service agents as one live chat agent can provide assistance to multiple customers simultaneously. Live chat offers real-time support to the customers and thus, it saves a great amount of time and money. Retention – Reports states that live chat increases customer retention rates between 48-63%. And as we all know, selling to loyal customers is much easier and cost effective than converting new customers. There are businesses which do not offer live chat. This calls for a great opportunity. Why not step ahead and gain a competitive advantage by offering a live chat solution on your website? By providing live chat support and quality customer service, you can win the hearts of your customers. Post Affiliate Pro reported that they observed 23% of the increase in conversion rate after implementing live chat on their website. With the help of live chat, you can offer 24/7 support during the checkout process which will increase conversion rates and reduce the chance of losing sales. Live chat is the best way to build a strong relationship with customers. When customers feel that their concerns are solved, they will share positive experiences with those around them. This also builds trust, fostering a stronger relationship between the customer and the company. When your existing customers see that they get top-notch customer support, they will be more inclined to spend more and stick to your brand. If you manage to offer good support to the customers through live chat on their first visit, they will become loyal customers. If you are looking to quickly increase your ecommerce business revenues and build a long term relationship through great customer service, live chat is the solution you’ve been looking for. Using this tool, you will be able to provide a “WOW!” experience to your valuable clients and customers. Live chat helps considerably in decreasing costs, and increasing average order value and sales. It is a perfect combination of efficient technology and human contact. Sam Makad is an experienced writer and marketing consultant at Acquire Chat. His expertise lies in marketing and advertising. He helps small & medium enterprises to grow their business and overall ROI. 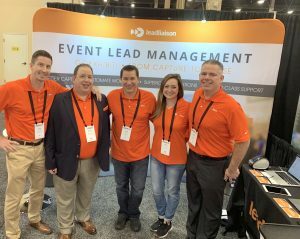 Dallas, TX – Lead Liaison’s event lead management solution, GoExhibit!™, is growing in popularity among event marketers across the globe. With the increase in users comes an uptick in user requests. At Lead Liaison, an uptick in requests means more innovation at a faster rate. The sales and marketing platform that is “built by its users” released a list this week of Q1‘19 enhancements to GoExhibit!™. Enhanced customization was a key focus in this update. Users are now able to change the app’s color, insert their logo, and custom content sections for embedded content like maps, videos, and more. When event managers give their reps access to the mobile lead capture app, they can now customize the invitation. Users can send those invitations by email and/or text message. GoExhibit!™ also released lead capture support for NFC badges as well as automatic post-show reconciliation, a method that can be used when Lead Retrieval providers do not offer a Developer’s Kit for integration. With these enhancements, GoExhibit!™ now supports nearly every method of lead capture. If exhibitors are able to obtain a list of attendees, they can now import and merge that information with the data captured by their team. Users with a GoExhibit!™ – Run Your Own Event license now have the option to print multiple badges at one time with Avery labels, or one-at-a-time with a Dymo printer. The new Self-Service Badge Printing feature allows event attendees to register or check-in at the front desk and print their own badges at the same time. To read a full recap of Lead Liaison’s updates, read their Enhancement Round-Up Q1’19. I’ve been thinking about the news I heard last Thursday, April 4th 2019, that a company called Integrate acquired Akkroo for $34M. Consolidation in the martech space is nothing new. In our six years in business, we’ve seen it happen over and over again, Oracle acquiring Eloqua, Upland Software acquiring LeadLander, Adobe acquires Marketo…the number of acquisitions goes on and on. Just look at the list of recent acquisitions on MarTech Today. As you scroll through, I bet you’ll recognize a few companies that were acquired. Then, you’ll murmur “I was wondering what happened to them”. Give it some time, and I’m betting you’ll say the same thing with this acquisition. I’ve never been one to be shy about comments. I’m not letting my thoughts marinate any further, and wanted to share a pragmatic view, as well as a dogmatic and slightly cynical one, and say congrats to Integrate and Akkroo. You’re going in the right direction. Brand dilution wasn’t my first thought after hearing the news. Instinctively, I thought – “how does this change our company?” The answer – it doesn’t change it, it helps it. The news about Integrate acquiring Akkroo only validates what Lead Liaison has been doing since the infancy stages of our business. We’ve been developing a sales and marketing solution that unifies top-of-funnel lead capture, converts leads, closes deals, and helps retain customers. Don’t believe, check our home page. We’ve had the “Attract, Convert, Close, Retain” message on our home page forever. So long that we even branded that on the back of our company t-shirts – no joke. As I further dwell on the acquisition, I read that in January 2019 Integrate announced it acquired ListenLoop to grow its set of tools and solutions for account-based marketing (ABM) advertising. We unveiled Lead Liaison’s ABM solution in late 2017 with resounding cheers from our client base. The news also reinforces the investment Lead Liaison has been making to simplify event lead management for the entire event tech space. B2B companies are spending more money on events as they recognize the impact that trade shows and other corporate events have on their top line. In fact, spend is on the rise as experts estimate 22% of a B2B company’s marketing budget is spent on events. Check out these 40 other shocking event marketing statistics. There’s no denying the event industry is becoming more high tech than ever and niche technologies will continue to be absorbed as event marketers demand more control and ownership over their event leads. Rest assured, we’ve long understood the value of in-person events as a viable lead generation channel. We began our company as a tracking solution and evolved into a robust sales and marketing automation company that helps businesses grow at scale. Over the years, customers pushed us to add more capabilities and introduce marketing features and sales solutions, peppered with a high dose of automation. Establishing our roots in automation has given us a leg up over our competition for quite some time now. When we rolled out GoExhibit!, our solution for capturing and managing leads at events, it was a natural progression for our platform as trade shows and marketing events were yet another top-of-funnel channel too irresistible not to support. Akkroo pulled off a major heist of $34 million dollars with a promise to eventually modernize the Event Market. At Lead Liaison, we have been at the forefront of bringing better solutions to market since the infancy stages. We welcome the competition, but fear that the true losers of this endeavor will be the investors. Let’s face it, we’ve seen this scenario play out a million times in technology. Big Brother (company A) buys company B and assumes they can force feed the new “solution” to their market at a greatly marked up cost. They throttle support in ways that only big companies know how to do and what was once a friendly relationship becomes very vendor-customer oriented. Customers will expect price increases at their next renewal. What happens next? Investors start to think: we aren’t making as much money as we hoped when we overpaid for this company. What do they do next? They cut product development, and make another slash to support. Next thing you know, you are paying a premium for a product that looks just like it did three years ago…and nobody will answer your calls anymore unless it’s to tell you that a bill is due. I feel honored to see other companies following suit as it further reinforces the direction of our company and justifies our continued growth. We’re incredibly proud of the fact that we’ve enhanced our solutions on our own, without needing to buy anything. Everything we’ve built is homegrown, from the ground up. Our customers benefit from this as they experience a fully integrated solution, with better support. Integrating companies is not easy. So, while we congratulate those that got a nice cash in; we invite the existing customer base of Akkroo to learn more about Lead Liaison. Congrats to Integrate as well. Fully integrated solutions are the way to go. We kicked 2019 off with a bang! An enhanced CRM/Marketing automation connector allows for deeper integrations. 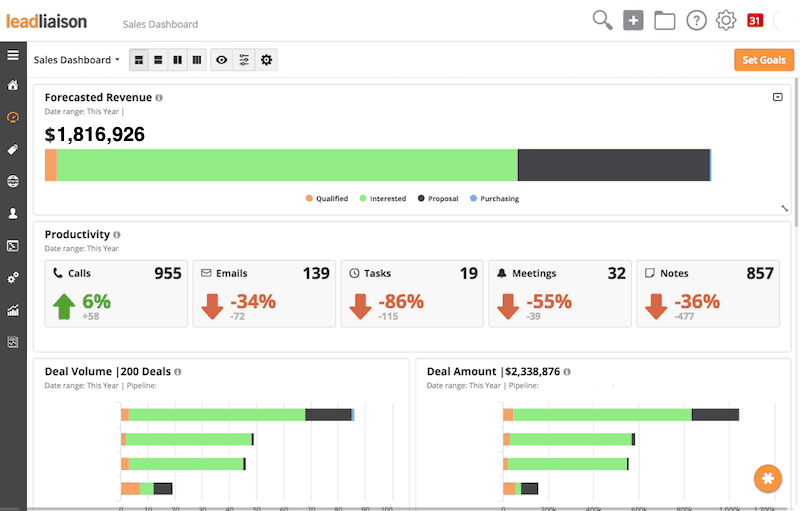 Our new Sales Dashboard is full of rich analytics. Plus, we’ve added over 10 new capabilities to our event lead management solution, GoExhibit!™. Read more below to learn about all of the enhancements we released in Q1 of 2019. 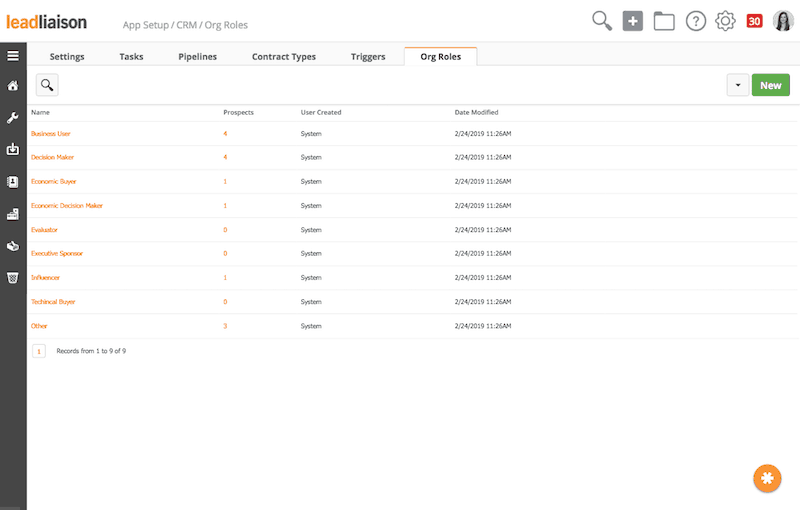 Enhanced CRM/Marketing Automation Connector – We’ve created a flexible CRM/MA framework to make it easier to integrate 3rd party CRM and marketing automation systems. Previously, only limited fields could be mapped from Lead Liaison to external systems. Now, all standard and custom fields can flow from Lead Liaison into your CRM resulting in a deeper integration. The developed framework complements other CRMs, whereas existing enterprise integrations with Microsoft Dynamics and Salesforce.com remain available to customers. 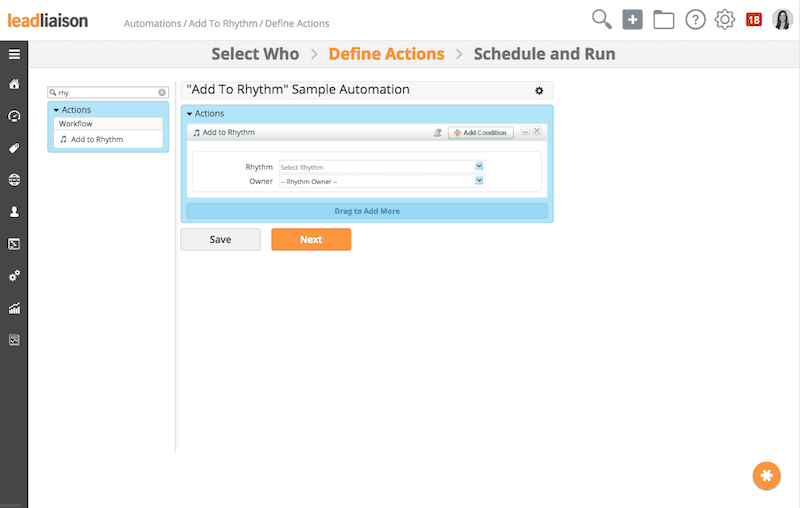 “Add to Rhythm” Actions – Users can now automate adding people to a Rhythm in bulk! Previously, users could only import contacts into a Rhythm. Now, users can utilize the “Add to Rhythm” bulk action or automation action to add contacts to a Rhythm. 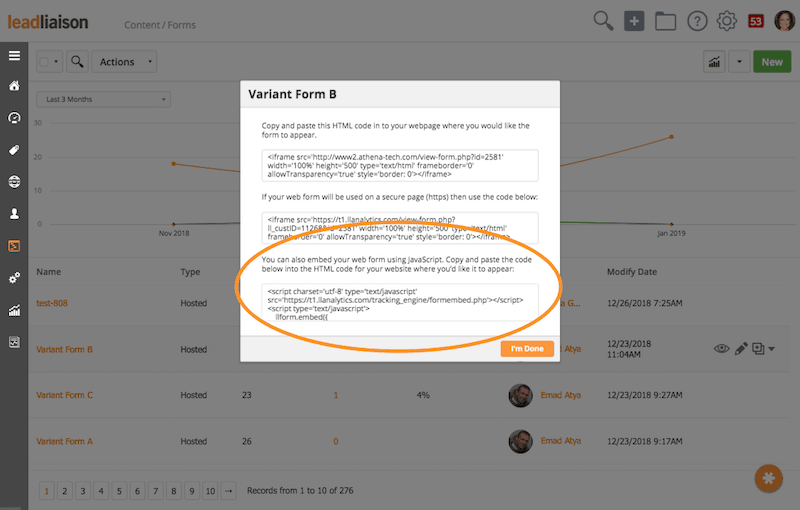 Use Your Own Content Dynamically – We now offer the ability to display custom website content using prospect criteria. Instead of being restricted to Lead Liaison’s “Dialogs”, you can use any type of custom web content. To display custom content, set rules for displaying the content and our software will generate code to add to your web page. The code will allow you to “hook in” and invoke your custom content. 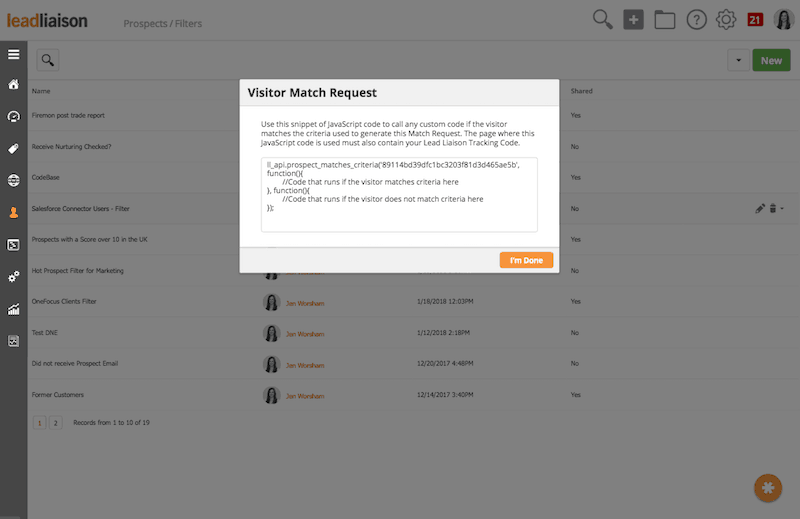 Visitor Tracking API – Lead Liaison’s Visitor Tracking API allows businesses to pull in business and Prospect data tracked by Lead Liaison’s visitor tracking into their own database or software. This allows businesses to benefit from Lead Liaison’s tracking without ever having to log into Lead Liaison. The dashboard also provides multiple ways to view data, including a mode for displaying the dashboard on a TV. Display sales productivity in your office, conference room, or sales team “bullpen” to create a shared and more competitive environment. Organization Roles – OneFocus now supports Organization Roles (ex: Business User, Decision Maker, etc,) to further enable businesses to track critical Organization data and take action as needed. 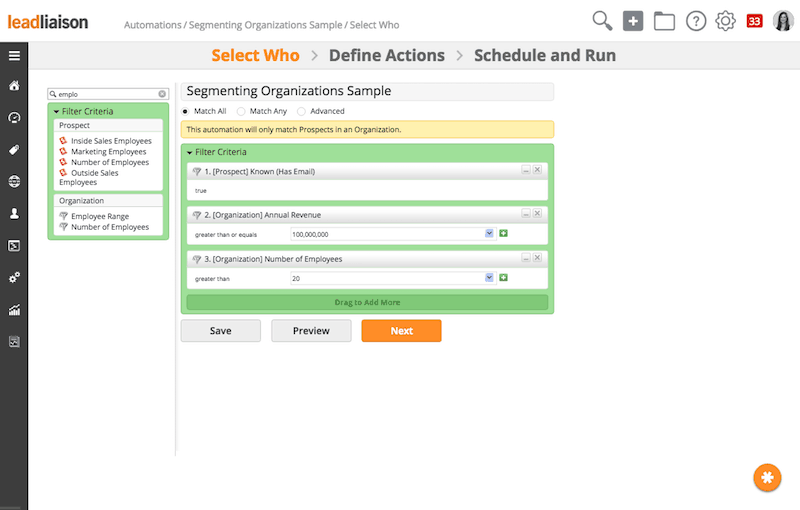 Segmenting Organizations – Users now have the ability to use Organization fields to segment their database. Invitation Customization – When event managers invite new users to an event in GoExhibit!™, they can now customize the invitation in addition to, or in lieu of, the existing message. Users now can also send invitations by email and text message simultaneously. 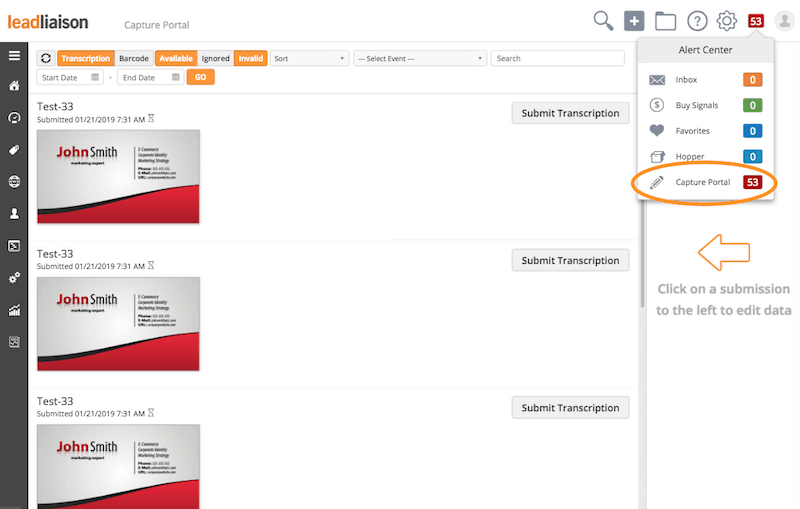 Capture Portal – GoExhibit!™ now features a Capture Portal, which holds lead capture submissions that are incomplete or erroneous. Users can go back into the Capture Portal during/after an event to edit invalid submissions. Import Event Leads – Previously, the only way to associate Prospects with an Event (in the web application) was to capture them using our mobile application, GoCapture!™. Now, users have the ability to upload Prospects directly into an Event (in the mobile application) using a .csv or .xls file. Imported data will also be merged with existing records within the same event. Voice Recording – Our app, GoCapture!™, now has the ability to record voice memos. You can add this as an option when building your form in the web application. It will appear as a button on your mobile device lead capture form, which you tap and record an audio clip. Lead Liaison will generate a custom URL of the audio file, which will be saved in the notes section of your form. *Voice-to-text available soon! Dymo Printing Support – We already supported printing badges with Avery. However, if you just want a single badge printed at a time (rather than a sheet of badges), you will now be able to use Dymo Printers with GoExhibit!™. 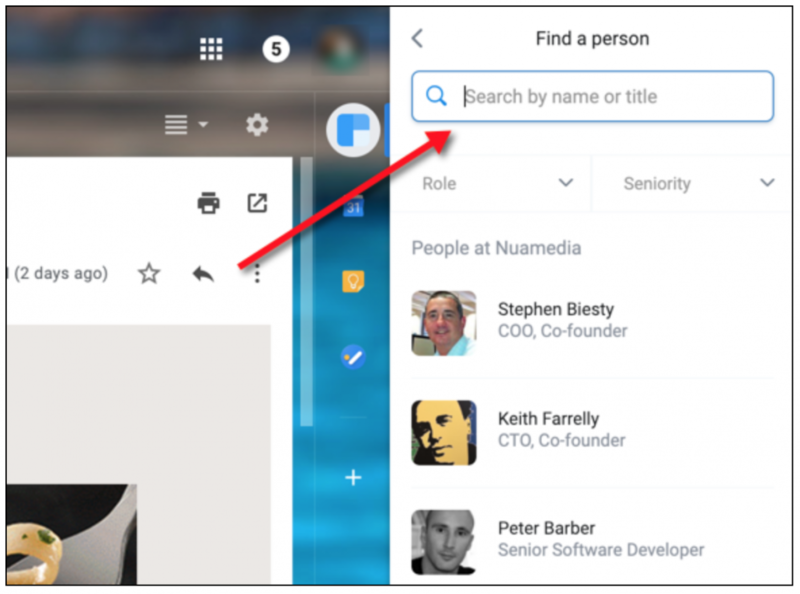 This feature is ideal for managing badges at the front desk of your event. Salesforce.com Marketing Cloud – create a new lead inside of Salesforce.com Marketing Cloud. Self-Service Badge Printing – GoExhibit!™ Self Service Badge Printing allows event attendees to register or check-in at the front desk and print their own badges at the same time. This works when the registration/check-in front-end system is running on any computer (laptop or tablet) with Windows or Mac, and connected to a Dymo printer (wired or wireless). 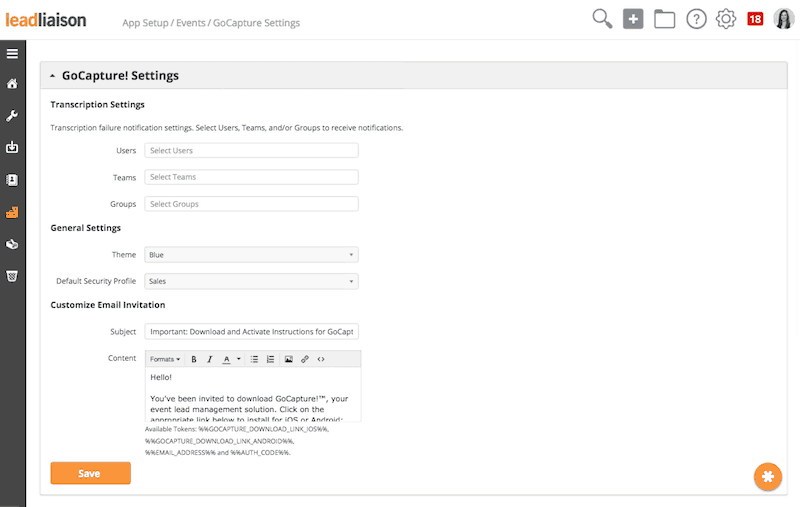 Edit Submissions – GoExhibit!™ now allows users to edit lead capture form submissions after they have been submitted. If you are already a Lead Liaison customer, contact your Account Manager with any questions and we’ll be happy to assist. Lead Liaison has been nominated for the Sales Technology of the Year Award at this year’s Sales Innovation Expo held at the Excel London on March 27th and 28th, 2019. You meet someone at an event and scan their business card or barcode, or fill out an electronic form. Then, they instantly receive a personalised response via either email or SMS. When they engage, you’re able to see them on your website Let that sink in for a moment, real-time engagement tracking for your show leads. You’ll be able to track how many website visitors you’ve had during and after an event, as well as how engaged they are. All reporting is live, so you can check up on how many leads each salesperson has collected as well as the quality of the conversations they’re having. Big tech for big events, we support multi-language input as well as having native marketing automation and visitor tracking to enable all of this to work all within a single platform. Come and see us on stand 2782! Dallas, TX – GoExhibit!™ made its trade show debut at EXHIBITORLIVE in Las Vegas this week. The event lead capture & management solution has been sweeping the industry since its release in late 2017. This was the first time the company showcased it live. Conference attendees were highly attracted to the revolutionary solution for event lead capture. Lead Liaison’s booth buzzed with excitement as the staff demonstrated GoExhibit!™ by using it to collect their own lead data. GoExhibit!™ integrated with ITN International, the show’s lead retrieval provider, to support lead capture via NFC badge scan. Booth attendees received a text message follow up, often before they had even left the booth, and ensuing communication as post-show engagement continued. Real-time demonstrations emphasized the company’s belief in immediate, intentional, and personalized follow up. GoExhibit!™ was mentioned in several of the educational sessions and conference panels throughout the week, as well. Lead Liaison surpassed its goals for the show. Much of their success can be credited to the use of their own solution at the event. In addition to using their mobile lead capture app, aptly named GoCapture!™ in the app stores, Lead Liaison had laptops on-hand tracking real-time event data. Representatives were able to demonstrate the Events Dashboard, a key feature of GoExhibit!™. The Events Dashboard displayed live data such as Total Prospects Captured, Average Engagement Score, Top Performing Sales Representatives, and more. Lead Liaison also showcased another crowd pleaser with their Run Your Own Event solution. 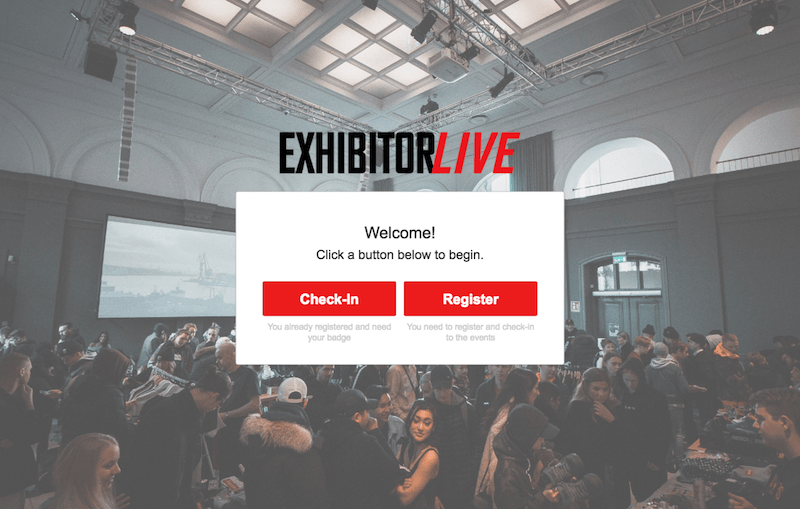 This solution was on full display at EXHIBITORLIVE 2019, demonstrating how businesses can use it to run user conferences, vendor conferences, and road shows. What sets GoExhibit!™ apart from the other lead capture exhibitors is the fact that it enables businesses to foster stronger relationships from capture to close. GoExhibit!™ integrates with a multitude of CRMs, including Salesforce.com and Microsoft Dynamics, as well as marketing automation platforms such as Salesforce.com Pardot, Oracle Eloqua, Salesforce.com Marketing Cloud, Adobe Marketo, and HubSpot. It supports all types of events; even those without badges. It’s compatible on all devices and Lead Liaison doesn’t charge per user, so companies can have as many lead capture devices onsite as they want. To access an overview of GoExhibit!™ features, click here. Lead Liaison provides cloud-based sales and marketing automation solutions that help businesses accelerate revenue by attracting, converting, closing and retaining more prospects. Filling a void in the small pool of automation providers that focus on marketing-centric functionality, Lead Liaison gives equal focus to sales providing sophisticated visitor tracking and sales automation to boost sales effectiveness. Additionally, Lead Liaison is the global leader in event lead management, enabling companies to capture and manage leads from trade shows and events. Lead Liaison blends ease-of-use, a flexible architecture, deep external integration, marketing across social, web, mobile, email and offline channels and powerful functionality into a single platform, called Revenue Generation Software®. Lead Liaison is headquartered in Dallas, Texas. For more information, visit http://www.leadliaison.com or call 1-800-89-LEADS (895-3237). To access our Press Kit, visit http://www.leadliaison.com/press-kit. Dallas, Texas – Sales and marketing solutions provider Lead Liaison will be exhibiting at the 2019 EXHIBITORLIVE conference in Las Vegas, Nevada. The global leader in event lead management will be showcasing their solution, GoExhibit!, and how it manages event leads from capture to close. This three-day event will be held on February 25-27, 2019 at the Mandalay Bay Conference Center. Lead Liaison will present exciting new capabilities such as NFC badge scanning, voice recording, branding capabilities, registration and badge printing, and more. 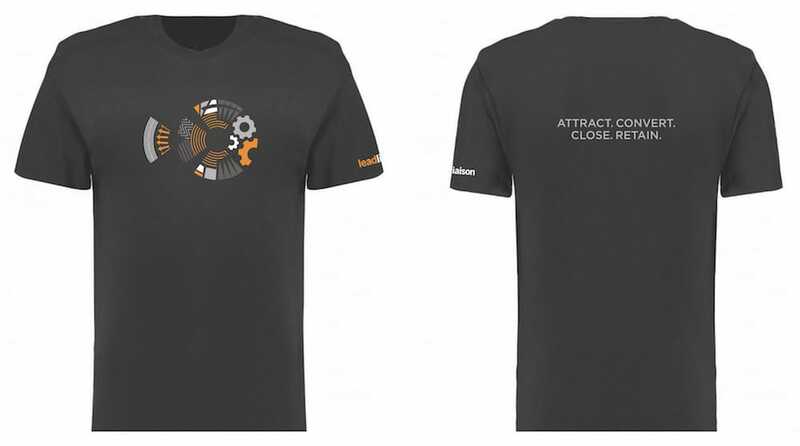 They will demonstrate GoExhibit!’s ability to be a holistic solution, from form customization and lead capture, to distributing and following up with the lead while interest is still at its peak, to sending the lead on to CRMs and marketing automation platforms. They’ll also be announcing the industries first lead capture app that runs on Microsoft Windows, allowing companies to capture leads on any Windows device, such as Windows mobile devices or Surface tablets. EXHIBITORLIVE is The Professional Development Conference for Trade Show and Corporate Event Marketing. This five-day educational event features 170+ sessions and workshops with the industry’s largest exhibit hall, including nearly 300 exhibitors. This is where you will find the latest products and resources shaping the future of exhibiting and corporate event programs. Get your free pass to EXHIBITORLIVE 2019 by clicking here. If you would like to schedule time with the Lead Liaison team, click here or come by booth 1056 during the show. More information on all of the exhibitors, sessions, and speakers can be found here. Lead Liaison provides cloud-based sales and marketing automation solutions that helps businesses accelerate revenue by attracting, converting, closing and retaining more prospects. Filling a void in the small pool of marketing automation providers that focus on marketing-centric functionality, Lead Liaison gives equal focus to sales providing sophisticated visitor tracking and additional website engagement tools to boost sales effectiveness. Lead Liaison blends ease-of-use, a flexible business model, deep external integration, marketing across social, web, mobile, email and offline channels and powerful functionality, all specifically tailored for mid-sized businesses, into a single platform, called Revenue Generation Software®. Lead Liaison is headquartered in Dallas, Texas. For more information, visit http://www.leadliaison.com or call 1-800-89-LEADS (895-3237). If you’re in B2B sales then it’s important to know how to find email addresses. Lead Liaison did a study on 100 people to see if we could find their email address. We already had their correct email addresses (in other words, we knew the answer); but, wanted to tackle the project as if we were a sales person trying to find an email address. We set out to figure out the best ways to do this. We scoured the web for the best tools, looked at using methods like Twitter, general web searches, guessing email patterns, etc. There’s really no easy and reliable way to find someone’s email by doing it on your own. Fortunately, there are some great software tools out there that took away all the hard work. Our study identified seven main software tools that can be used for free or for little to no charge ($.07 per lead). For our study, we took 100 people along with their domain names and manually entered them into each of the seven tools. It was a lot of work, but some really good results and learnings came from it. The email addresses were sourced from prospects, address book contacts, and customers. Some of the tools allow bulk uploading, but we did it all by hand, one by one to save you the time! We ranked each of the seven tools based on price, quality, and user experience. 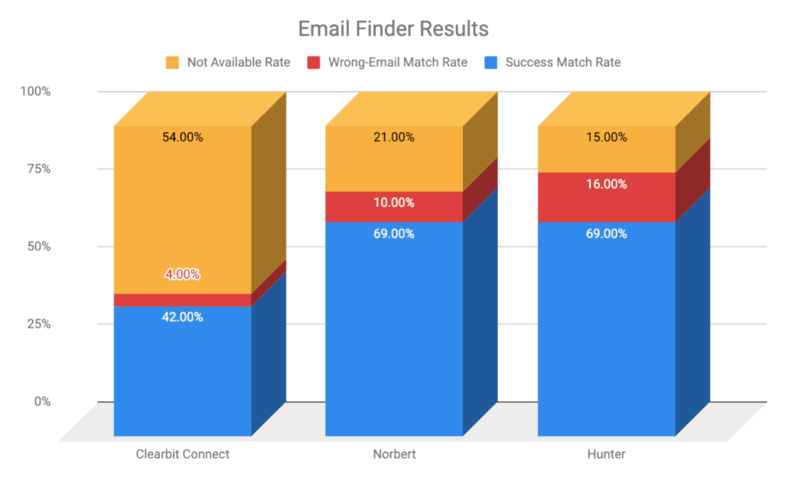 The top three tools to find email addresses were Clearbit Connect, Norbert, and Hunter – in that order. In the analysis below, you’ll find a table that ranks each of the seven solutions. We created videos demonstrating how to install each tool and videos demonstrating how to find email addresses using each tool. Blue (Success Match Rate): Percentage of attempts the provider was able to successfully find the correct email address for the person we were looking for. Red (Wrong-Email Match Rate): Percentage of attempts the provider returned an incorrect email address for the person we were looking for. Yellow (Not Available Rate): Percentage of attempts the provider returned an incorrect email address for the person we were looking for. 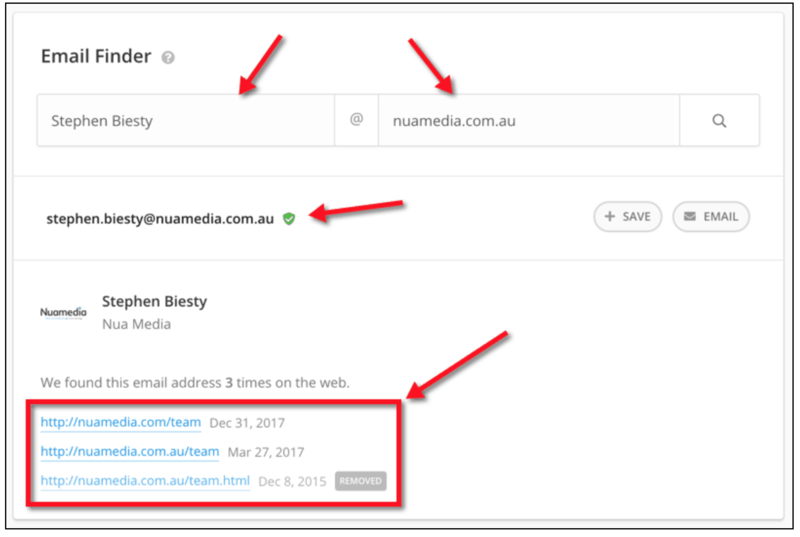 See the section on the Top 3 Ways to Find Email Addresses below for a deeper analysis on the top 3 tools. When we began this analysis we were skeptical that there were accurate ways to find email addresses. However, after this study we found that were were able to successfully find someone’s email address 86% of the time! You can do the same! That’s really an incredible result, and very accurate. The method we describe below is a full-proof plan for any sales and marketing organization who wants to develop a consistent prospecting process. To find email addresses 86% of the time, install the top three ranked tools below. 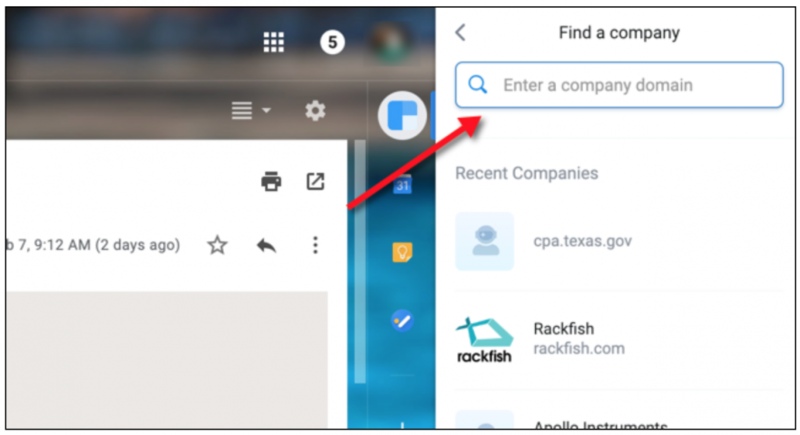 In the “Ranking Ways to Find Email Addresses” section below, each tool we analyzed comes with a video demonstrating how to install it and how to use it. Since Clearbit Connect had the lowest amount of incorrect email addresses returned and didn’t use a credit unless it found an email, start your searching by using Clearbit Connect first. If you can’t find the email address in Clearbit Connect, then use Norbert next. Norbert had the highest accuracy (same as Hunter) but also the 2nd lowest error-rate. If you can’t find your email in Norbert, then use Hunter. After trying each of these solutions we’re confident that across all three one of them will show you the correct email address. Find an email address for someone 86% of the time! Download our analysis of 100 people and domains to see the complete results for Clearbit Connect, Norbert, and Hunter. Rank: Overall rank based on quality, price, and user experience. Tool: Name of the tool to find someone’s email. Installation: Video showing how to install the tool. Usage: Video showing how to use the tool to find an email address. Free Credits: Number of free credits the tool provides (noted one-time or per month). Minimum Paid Plan: Cost per year if you subscribed to the tool. Price per Email: Takes the total number of email addresses the tool provides in a 12 month period and divides that by the total paid plan amount in 12 months. Notes: Any tips or special notes for the tool. In our analysis there were three clear winners, Clearbit Connect, Norbert, and Hunter. We discuss the reasons for the ranking and our experience below in more detail. Clearbit Connect also doesn’t charge a credit unless it successfully finds an email address for you. They had the least amount of incorrect emails. It’s free with 100 credits (100 correct emails) per month. You can install it on any email account. Use their Chrome Browser plugin for your research. It starts by clicking their icon, then entering in the domain name for the person you’re searching for. To find the domain name, head to the website where the person works. The domain name will be the value before the “.com”. For example, in “https://www.google.com” the domain name is “google.com”. 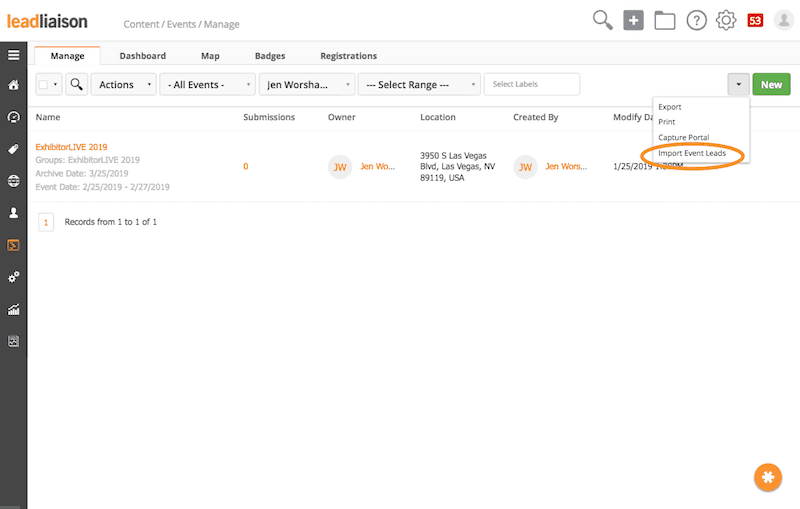 If Clearbit Connect returns a company match, select it, if not hit enter. Price: For a solid prospecting stack, you can stick with the free version of Clearbit Connect. However, if you’re looking to pay for it then heads up – it was the 3rd most expensive price per contact out of the seven tools we analyzed. User Experience: The Chrome Browser plugin loaded inside our email inbox. As a heads up, it also starts to collect all of your email addresses from your account. This is a bit invasive, but could be a good trade depending on your goals. In the next screen, enter the person’s name. Norbert was very accurate, and did not make a lot of mistakes. We found the Chrome Browser plugin was a nice (1st screenshot), but a little clunky at times. It seemed to have a few bugs in the User Interface. As a result, we switched over to their web application (2nd screenshot) which seemed a bit easier to use. The only tradeoff with Norber is that it took more time to find an email address. When compared with Clearbit Connect and Hunter, which were pretty much instant, it took up to several minutes at times to return a result. We didn’t mind this that much though, as we were playing the role of a B2B sales person. Queuing up searches in another top didn’t disrupt our workflow. The other thing we didn’t like with Norbert is that it charged a credit for each request we made. Since Norbert either returned an incorrect result or no result at all 31% of the time, that means that 31% of the time you’ll get charged a credit and get no value in return. If you’re using the free version, it only gives you 50 email credits for one-time usage. Unlike Clearbit Connect and Hunter, the credits don’t reset every month. Once you’ve used your credits – you’re done, and you need to go for the paid plan. Fortunately, the paid plan is very affordable. All things considered, the experience, the accuracy, low error rate, and cost per credit put Norbert in second place. Going for a paid plan here is worth considering as part of your prospecting stack. It returned results almost instantly. Unlike Norbert, there was no waiting. Cost was very competitive. They were the 2nd least expensive solution out of all seven providers we analyzed. It returned the most number of accurate emails (tied at 69% with Norbert). It also scrapes the web, and shows exactly where the email address was found. That gave us added confidence in the results. It also showed a verification symbol, see the green icon below. This also gave us a confidence boost. Based on quality, user experience, and price, Hunter was a close 2nd. The only reason why it came in third is because of the higher number of inaccurate emails that it returned. It was 6% more inaccurate than Norbert, and 12% more inaccurate than Clearbit. You can’t beat the price per email though! Use the free version of Clearbit Connect to generate 100 new email addresses in a month. The paid version will set you back $6K in a year. That’s a bit rich for our blood, so the free version did the trick. Buy a Norbert account. It’s gives you 50 free credits. However, a subscription is very affordable and worth the investment. At the time of this analysis, and annual subscription was $468. Buy a Hunter account. 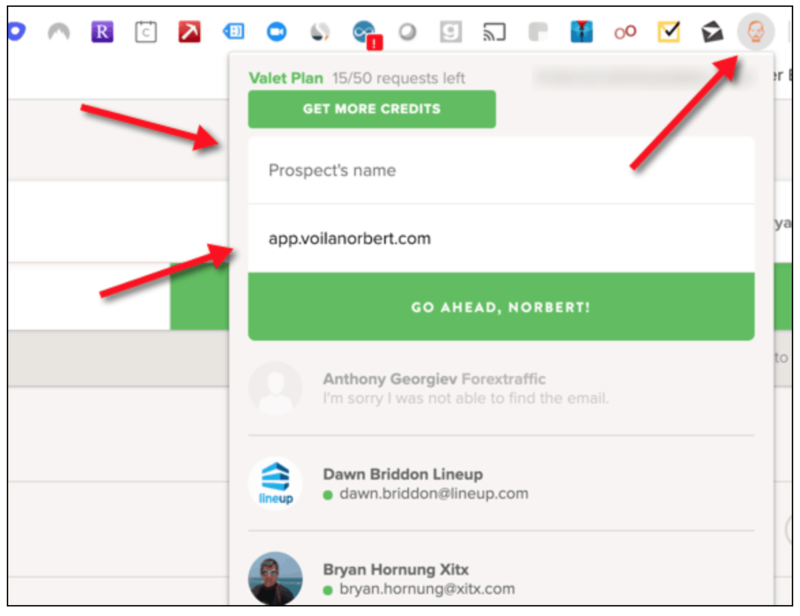 You could use the free version and get 100 emails per month; however, similar to Norbert, it’s very affordable and worth the investment. At the time of this analysis, and annual subscription was $408. For $876 a year, I’d feel comfortable going to my boss and asking him/her for the money. Assuming you used each of the three tools above for your stack, you’ll be able to find about 12,000 email addresses in a year. That’s 1,000 correct emails in a month. That’s more than enough for a single person. Depending on your individual capacity and your approach to B2B sales; this solution could cover one to 20 B2B sales reps. The bottom line is that your cost per lead (CPL) is $.073. That’s less than a dime for a prospect! Compare that CPL to the CPL of other sources, such as paid search, trade shows, etc. Sure – you can argue that other channels are more qualified prospects, but you can’t beat the cost as long as you work your leads. Pro tip: Use Lead Liaison’s Rhythms to feed your new prospects into a step by step sales plan so you can stay ultra-organized and be efficient with your prospecting. In conclusion, whether you’re looking for a free stack or a B2B sales stack to find email addresses, you can’t go wrong with the aforementioned tools. We hope this study is helpful and gives you the answer to how to find email addresses.